The Most Award-Winning Party Game in History! Not a trivia buff? It doesn’t matter! Each player writes a guess to a question such as “In what year did the bikini swimsuit makes its first appearance?” or “How many feet wide is an NFL football field?” and places it face-up on the betting mat. Feeling confident? Bet on your guess. Think someone else knows better? Bet on their guess. Strike it big and you’ll be cheering like you just hit the jackpot! Wits & Wagers is most fun with seven teams at a large party or family gathering. Each of the seven teams should have one to three players. Ah Trivia games. What a love/hate relationship. For me, (and I’ll wager and many other gamers), taking out a trivia game is the perfect way to ruin an evening. You either watch helplessly as your self-esteem dissolves into a gelatinous mass or you suddenly feel animosity, perhaps even jealousy for one of your life-long friends. Trivia games suddenly become anything but trivial. But fear not! Along comes a trivia game where you don’t have to answer the question correctly. Wha? Wits and Wagers is a party game, and thus really doesn’t have a theme but its style is just right. Family friendly. As for the components, everything works. The cards are thin, but only 7 are used per game so they will hold up fine. The other items (felt betting mat, chips, pens, dry-erase boards etc.) are sturdy and will last through many games. Every now and again, a game comes along that makes you say: “What a great idea!” The game mechanics are simple but ingenious. There are 7 questions/rounds in the game. All the questions have numerical answers. Each round, a question is asked and players simply have to guess closest to the numerical value without going over (like the Price is Right!). A sand timer is turned over and each player/team writes their guess secretly. The answers are arranged on the betting mat from lowest to highest. The timer is turned again and players then wager on the answer that is closest to the actual answer, (even if its not their own guess). The answer is revealed and players or teams receive payouts for guessing correctly. I mean, you don’t even have to be correct! What kind of trivia game is this? Players can bet as many chips as they have. But as with most wagering games, it depends on how confident you feel about your own answer, or someone else’s. The game is short, smooth and elegant. The game includes 100 trivia cards with 7 questions on them. So you have enough for 100 games. When is the last time you played a party game 100 times? (It’s a rhetorical question). Also, since all the answers are numbers, even if you happen to get a repeat question, are you going to remember that the Mississippi river is 2,302.15 miles long? It’s a lot of fun and replay value for $20-30. There are a few key points to this game that make it a gem. Next – the game can be played by 4-20 players – in singles or in teams. So it’s very versatile depending on size of your playgroup, circle of friends, family or Elk lodge. And less obvious – since the game’s questions are all numerical (but are NOT only about numbers), and hardly anyone would know the exact answer, it promotes logical thinking… even deduction. Think about it. In the example above, if you think that the Mississippi river is around 2,000 miles long, essentially you are in the right ballpark. And in this game, you are rewarded for being in the right ballpark. How your brain gets to that ballpark is the positive, almost educational aspect this game has. The questions and answers are very unique and adults and children alike will be entertained and challenged without jealousy, or loss of self-esteem. I don’t care for party games. There’s usually not much thought or real strategy. If I win or lose I don’t feel like I’ve done anything. Often times there is too much randomness. While much of this can be applied to Wits & Wagers, for a party game, its ok by me. Wits & Wagers usually makes an appearance at some of the family functions. It works well in this setting, but it does have its ups and downs. The game is very simple to play. There are seven rounds, each with a completely unanswerable question with a numerical value of some sort. This could be, “What year did Jackie Robinson hit his 100th homerun” to “How many presidents were left handed?” All the questions are number based and each player/ team answers then they are arranged highest to lowest on the felt board. Once all the answers are laid out for all to see everyone wagers on what answer they think is the closest without going over. We call this Price is Right rules. Each player has their own player chips that they can wager that they never loose. But as they answer questions correctly they also gain actual chips. You can also bet with these chips, but if you’re wrong you lose these chips. Whoever has the most chips at the end of seven rounds wins. I would grade the components pretty high. I like the felt piece that is the board. Gives you a nice “wager” feeling when you’re betting. The boards you write your answers on with dry erase markers are also nice and a big step up from just writing on paper. The one down is chips you actually win. They are your common plastic poker chips. Nothing special. •	Everyone is welcome in this game. It can be played with few people or break up into teams and it’s just as fun. Very inviting. •	No one can answer these questions. That’s not even the purpose of the game. So people who are afraid of looking stupid should have no fear. •	The rules and questions are set in a way I think it would be impossible for anyone to get upset and turn over a table. A must for all party games. •	No one has to sing or dance or act anything out. Those with a shy personality are welcome. •	There is no reward for having the correct answer. This is a slight downer. •	The game is designed to end after seven rounds, resulting in everyone betting all their chips on the last round trying to make up the difference. Not a huge fan of this mechanic. •	It’s a party game. I’ve played a few times with the family and every time we have a good time. The questions are pretty out there and bring with them relaxed play, decent conversation, and laughs. There are some out there who will only play party games, if you’re with them at least this game is tolerable. As a Party Game I give it 8/10. On the broad scope of all games I would prefer to play 5/10. Wits and Wagers is fast, easy, yet offers a really complex strategic lesson which helps players get a grasp of economic principles of risk and uncertainty. Great appeal for high IQ players and young children. The felt playing field is nice. Allowing players to write down their answers with erasable ink makes all players feel invested in the game — a really good way to keep younger players engaged. Yet gameplay allows for lots of discussion and interaction. Wits & Wagers is not turn based in the sense that everyone waits for the one slow player to take their turn (ala Monopoly) which is good design. And even though one player will be in the lead, even during the last stage, other players can catch up by taking big risks. Very fun. Wits and Wagers is a trivia game that puts the “fun” back into trivia for everyone. No more dreading a trivia game where you know that you’ll get stomped by some trivia buff wishing you could just get a game of “old maid” in to save your sanity. 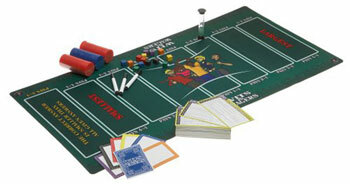 The game revolves around 7 rounds of questions with each player writing down their answer on a secret dry erase card. Answers are put in order on the playmat with increasing odds. Players place both of their bets with poker chips on the answer they believe is closest to the right answer without going over. The banker pays out the correct answers based on the odds in chips. The person with the most chips at the end of the game wins. Really, a simple game. When I was young, I used to be pretty good at trivia games. My mom was better than me. Not many people wanted to play me, and I didn’t always wanted to play my mom either. Not much fun when you sit around and stare at trivia game no one wants to play. Wits and Wagers addresses this problem, by giving everyone an equal chance by allowing players to bet on the right answer. There’s a skill involved in determining which answer to guess and hedging your bet on the right answer. It comes down to not necessarily how confident you are in your answer, but how confident you are in someone else’s answer. That comes with knowing the person as well and how well the know things. Of course, there can be some mind games going on if you want to try and throw off other players, but that is rare. I personally found it a breath of fresh air after all those years of playing Trivial Pursuit. I enjoyed playing it with my family which includes my mom. I like how just about everyone in my family could play. This game should be very fun and enjoyable for social, family, and casual gamers. Wits and Wagers is primarily a trivia game, but the obscurity of the questions levels the playing field for those of us who don’t qualify as Jeopardy contestants. All of the questions have numeric answers. Each player writes his or her guess, errr “informed response”, secretly on a dry-erase card. All players’ answers are revealed simultaneously, then sorted. The answers are placed on the large rectangles on the playing mat, low-to-high. Players then wager on which answer they think is closest, without going over. The payouts are higher for answers that are at the extremes. The middle (mean) answer pays 2:1. Answers to the right or left of the middle pay 3:1, and so on. The highest payout is 5:1 for the “All Answers Too High” space. This has a nice leveling effect because you don’t have to know the actual answer. You can go with the crowd, or bet big against them. Be sure to get the family edition if you want to play with the kids. So with most of my friends and family when I first introduce the game as “a gambling game mixed with random knowledge” it pretty much sells itself. With super easy rules, gambling and intriguing and random facts (how tall was the tallest LEGO structure? In what year did a woman trick the medical community into thinking she gave birth to a rabbit?) this is a great party game that has something for most people. This is my go-to party game for people who don’t play games very much, and a good a filler game between other games or as people are coming in. Some people get really into it and try their hardest using different strategies, while others sit back, relax and socialize. Surprisingly, for such a light game there are different strategies you can implement. Do you know the answer and try to skew the bets to get more money? Do you try to get the exact answer and bet? Or do you just bet on the best odds? Or maybe you just try to follow the player who you suspect knows the answer. All in all, it’s a great party game that is fun to break out every once in a while. Everyone at our party seemed to be having fun but by the end of this game I was so bored that I was playing games on my phone while waiting for people to finish betting. Seems to be good for some people but not for others. great game for anyone, even nongamers. people who don’t know anything love this game too since in the end it’s your sense of who knows the right answer and your betting skills that gets you the win. When you are done playing this game you would never touch another trivia game! 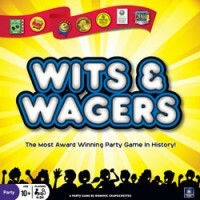 Add a Review for "Wits & Wagers"